You now Have the opportunity to visit the biggest two cities of Egypt, Cairo the biggest city in Africa and the capital of Egypt, and Alexandria Egypt's major port founded by Alexander the great. 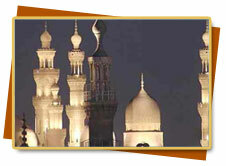 Our representative will meet and assists you in Cairo international airport, then you will spend the night in hotel. After breakfast meet our tour guide (who has a valid license) in your hotel at 8 am, then you will be transferred to Memphis museum where you will see the colossi of king Ramses the 2nd and the ruins of this ancient capital of Egypt ,then to Sakkara to see the steps pyramid and the oldest funerary complex surrounding it .You will have a lunch break then on the way to Giza there is a short stop at one of the papyrus factories to see in front of your eyes how the ancient Egyptians used to manufacture it, then you will move to Giza plateau to see the famous three pyramids of Cheops, Chephren ,and Mycerinus, and afterwards, the great sphinx. The last stop in the tour will be in your way back to the hotel, you will stop at another factory of the flowers pure extracts and the plow oriental chaps glasses .Finally, drive back to the hotel and overnight. After breakfast meet our tour guide (who has a valid license) in your hotel at 8am,drive to the citadel of Saladin to see the ancient walls and towers dates back to 1171 AD ,and the famous mosque of Mohamed Ali, the most famous mosque in Cairo sky line .Then you will move to the religious community (old Cairo ) to see the Hanging church ,the ruins of the roman fortress ,the synagogue of Ben Ezra ,and Amr Ibn EL-AAS mosque, the first mosque which was built in Egypt 642A.D.You will have a lunch break ,and then you will move to the Egyptian museum to see the fabulous collection of king TUT and much more from our ancient Egyptian antiquities. Finally, drive back to the hotel and overnight. -MONTAZAH PALACE: the summer residence of Egypt's former royal family, it was built on an elevation that overlooks one of the most attractive beaches of Alexandria. -the catacombs of KOM EL-SHOKAFA: these roman catacombs are rock-hewn in 3 tiers at depth of 100 feet. They date from the 2nd century AD. -the POMPEY PILLAR: this place contains the ruins of the Greek temple of deity serapes and the 27m. Height red granite pillar erected in297ad in memory of the roman emperor Diocletian. -THE FORT OF QUAITBAY: this fort was built in the 15th century and it was built on the ruins of Alexandria's famous ancient pharos which was one of the 7 wonders of the ancient world. -THE ROMAN THEATER: a small roman theater recently discovered it has 12 marble terraces in a semi-circle shape, and it is the only one of its kind in Egypt. Then drive back to Cairo and overnight. 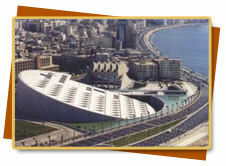 After breakfast our tour ends and you will be transferred to Cairo international airport. Accommodations (2 nights in Cairo). • All transfers by a modern air-conditioned vehicle. 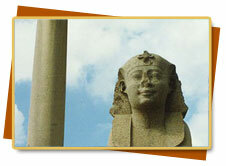 • Egypt entry visa, for non -restricted nationalities you can buy it upon arrival before passport control. Visa Cost $ 15 = 11 Euro per person adult or child. 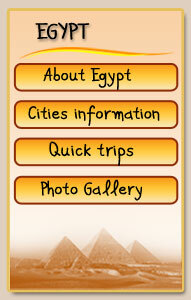 N.B: All of our tours can be customized to fit your time, budget, and interests. • Additional accommodation nights can be arranged upon request.